As a Philadelphia Wedding Photographer, I can attest to the beauty and novelty of the city of Philadelphia. This bustling yet serene city has a lot of rich history to it and many of the venues around here offer great locations for weddings. My experience with taking wedding photos has taught me that the background to a picture is at least just as important as the main object of the picture. With a wedding photo, one would imagine that all the focus will be on the bride and groom in the center of the photo. But this isn’t always true. Having a vibrant background that complements the couple’s garments as well as enhancing the smiles on their faces adds a ton of value to a photo. If the couple is in red, having a few red roses in the background helps to give the photo a tinge of love. If the couple is having a wedding themed blue, a shot of the clear sky above them or the sea behind them could do a world of wonders to how beautiful the photo looks. Wedding photography is as much an art as anything other form of photography, and a good photographer will have an eye for the right kind of setting to best capture the mood of the moment that the couple shares. Sometimes, the couple doesn’t even have to be in the center of the photo. They can occupy a space in the periphery while the beautiful sunset with gold tinged clouds takes center stage. It doesn’t make them any less important. What it does is tell a story about how their beautiful day is giving way to a beautiful night and more beyond. Philadelphia has a venue for just about every mood. These locations come with different capacities and price tags, but they all have a story to tell that you might find rhymes perfectly with your own story. Andalusia – This beautiful piece of American history is managed by the Andalusian foundations and consists of 50 acres of land with the great gem that is The Big House sitting smack in the middle. The Big House and the land surrounding it belonged to Nicholas Biddle, in the 1800s. He was a prominent financial and cultural icon during the formative years of the United States of America. Consequently, stepping into the Andalusian expanse feels a little like dipping your feet into the waters of history. Bartram’s Garden – On the west bank of Schuylkill River lies 46 acres of pure and unadulterated beauty. Some people know it as Bartram’s garden but this Philadelphia Wedding Photographer knows it simply as Beauty. This happens to be the oldest surviving botanical garden in North America and the flower gardens alone would provide a suitable background for just about any photograph. The John Bowman Bartram Special Collections Library would provide an excellent indoor setting for those who want to capture the beauty of the architecture from the inside. Belmont Mansion – This early 18th century mansion is located in Fairmount Park, Philadelphia is a great example of Palladian architecture; probably the most exemplary form of this school of architecture in the United States. The indoors offer great material for perfect wedding shots and happen to be fantastic for receptions. Colonial Dames – The National Society of the Colonial Dames is a great location for a simple wedding with beautiful lush gardens and muted pink interiors in the building. You can easily come up with a pink lace theme for your wedding here. Curtis Arboretum – This arboretum located at 1250 Church Road near Philadelphia used to be part of the palatial Curtis estate. The arboretum has a variety of tree species, giving it a splash of vibrant colors all year around. It also features graceful hills and two ponds that act as the crowning glory of the estate. Curtis Hall itself offers an excellent venue for weddings and the beautiful interior décor will be a dashing background for any photos. Fairmount Park Horticulture Center – This beautiful center was formerly the country seat of Governor John Penn. Now it is a beautiful garden with a Japanese House in its middle known as Shofuso. It was built in 1976 and contains a pond, a wetland, a creek, and an intertwined network of paths leading to various picnic sites. It has many Display Gardens containing herbs, vegetables, perennials, everlastings, and a demonstration garden. The Fairmount Park Horticulture Center is rife with great spots for excellent wedding photography that won’t disappoint. The Franklin Institute – If you’ve always held a thriving fascination for the exploits of scientist president Benjamin Franklin, and share that fascination with your significant other, then a wedding set in the Franklin Institute might just be the best thing ever. This great venue features fantastic places to do some serious wedding photography and give a historical filter to your photos. This particular photo was taken at a boutique style wedding studio in Old City. Old City is known as America’s most historic square mile. Here you will find the Old City hotel and many other great places. You can dine in a wide variety of restaurants and pubs, enjoy a theater or music performance and shop in our many fashion boutiques, art galleries and design showrooms. As a Philadelphia Wedding Photographer, I pride myself in being able to take in the scenes of the historic city. I also try to capture the most candid moments between the bride, groom, and their bridal party. 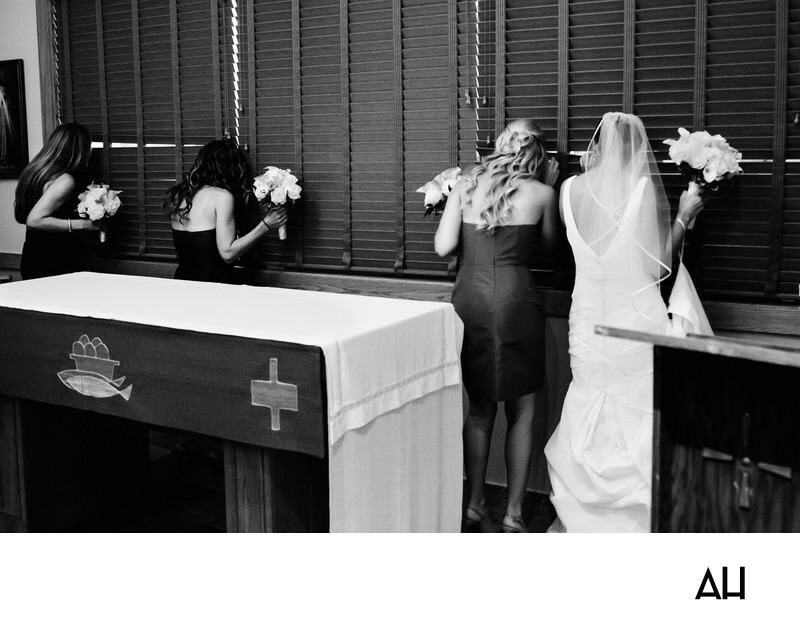 In the picture you can see the bride and her maids peeking through the wooden shades of the church just before the ceremony begins. They watch eagerly as the guests arrive. The atmosphere is almost visibly pregnant with expectation as the bride keeps a special look out for her future husband. The moment is filled with expectation, but also innocence as the photo communicates the anticipation for the events to come throughout the rest of the day. Perhaps the rest of their married life as well.